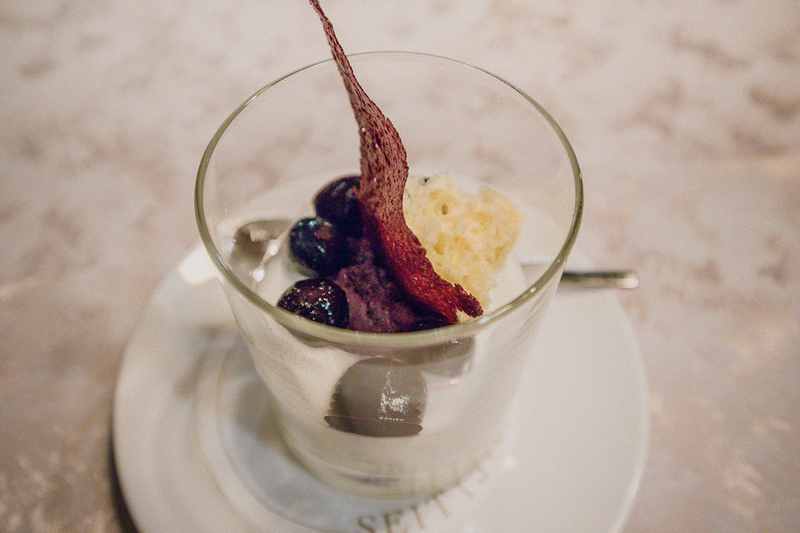 I had never stayed at a classic, Austrian family hotel like hotel Klosterbraü. And when I say classic, I mean classic with a capital C: this hotel opened in 1516 (yes, Columbus could have stayed here) and it has been owned and operated by the Seyrling family for hundreds of years. 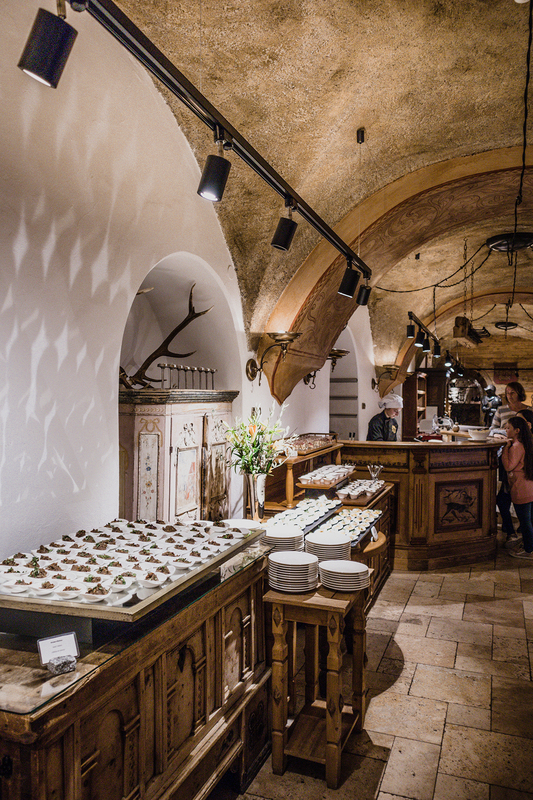 Hotel Klosterbraü was originally a convent, which is clearly visible from the enormous wooden doors, thick walls, adjacent church and (who doesn’t like a party) the beer brewery and enormous wine cellar underneath the hotel. 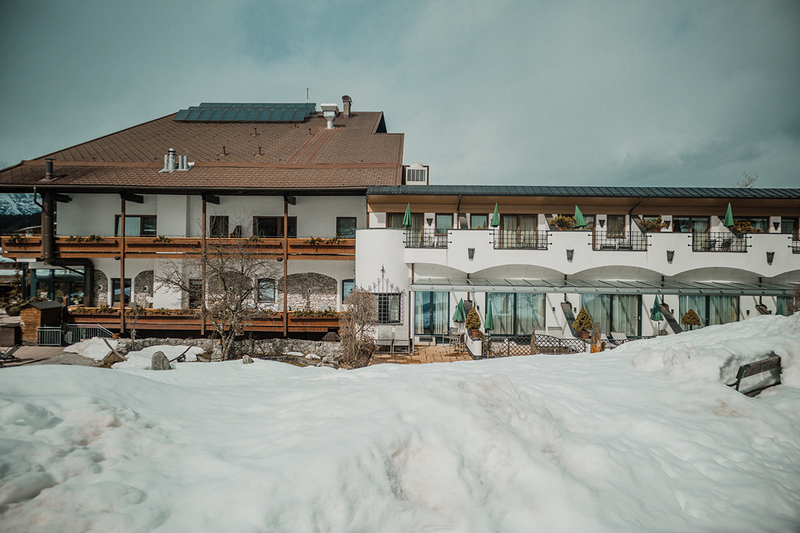 The long hallways are filled with candles, fire places and thick rugs and if this description somehow makes you think this is a remote former convent stuck on some mountain in a land far, far away, you couldn’t be more wrong! 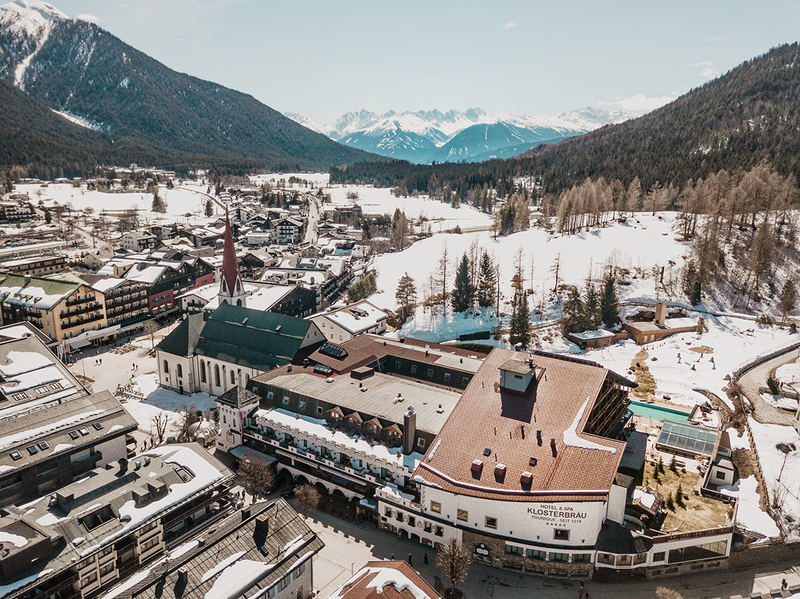 Hotel Klosterbraü is located in the heart of Seefeld, a lovely Tyrolean mountain town just a 20 minutes drive from Innsbruck international airport. 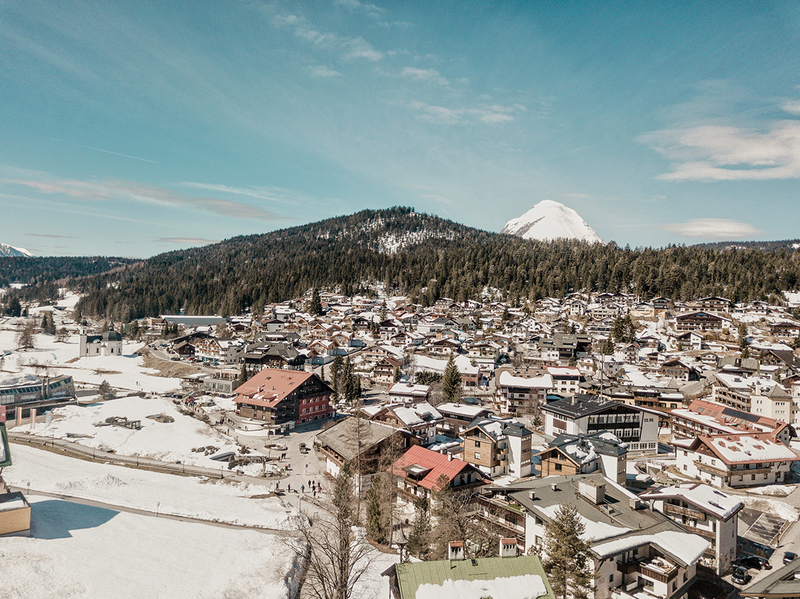 It’s a few minutes away from all the slopes, with shops and restaurants all around. Not that I ever felt inclined to eat anywhere else! I loved how every guest gets a special table for the entire stay, with your own waiter each day and little name tags on your own table. 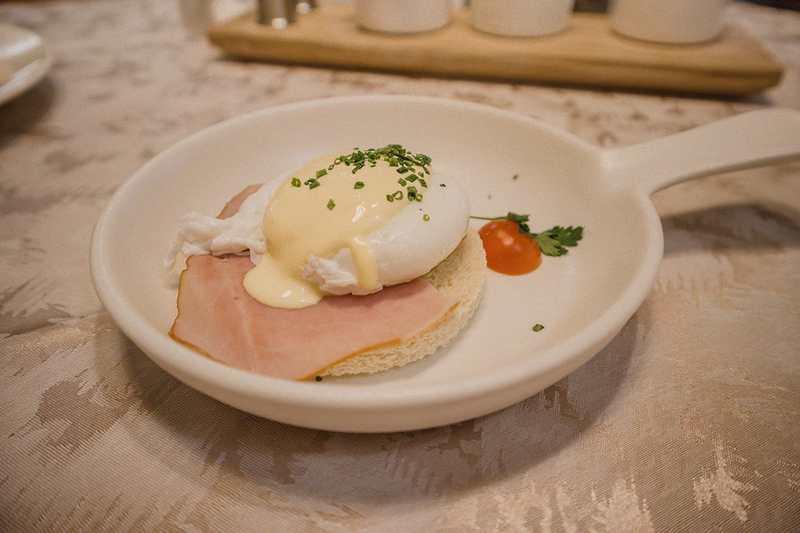 Breakfast and dinner were served buffet style and the food, the countless choices and the friendly service, were all of extremely high quality. 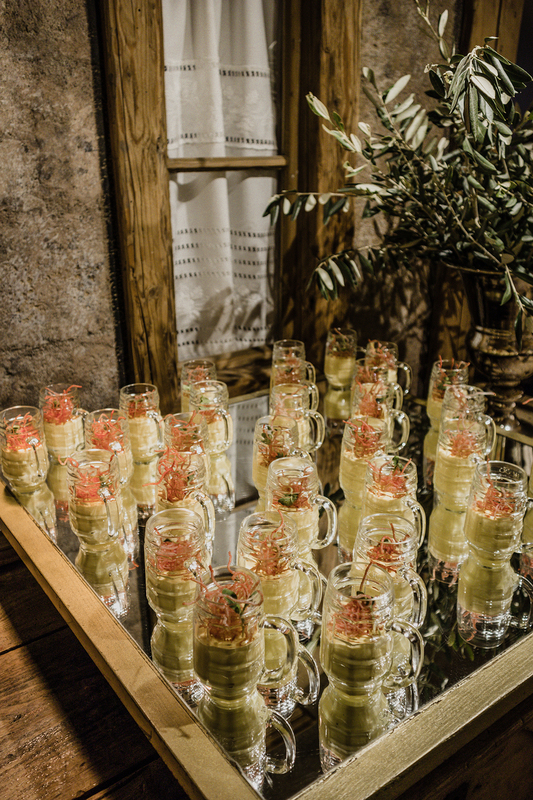 I loved the variation of mixing a few daily staples like a huge salad bar, with different themes on different days and special treats like a chef with local sausages, a fresh pasta station and varying desserts every day. There is something new every day to keep you interested and try something new to taste. 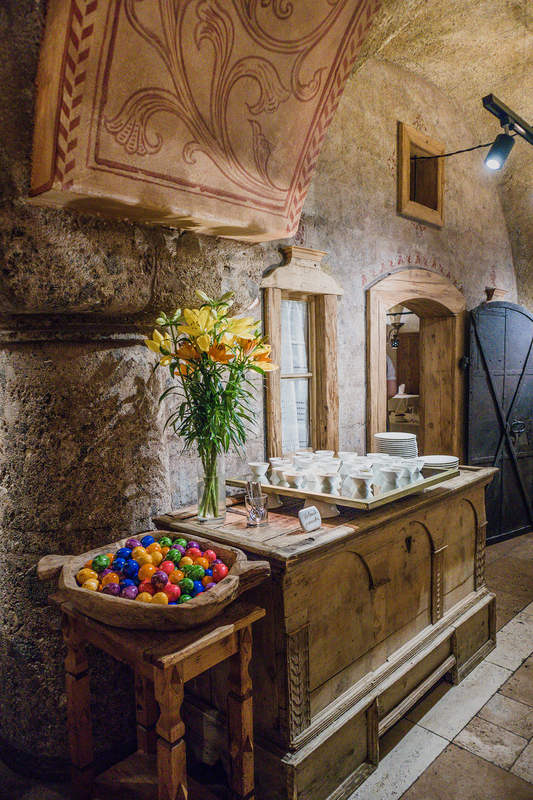 We stayed at the Klosterbraü during Easter and were amazed that on Sunday, we saw dozens of staff members decorate the long hallway with a table for no less than 180 guests! It took them hours to set up but they still managed to also create an Easter egg hunt for the kids, who loved it. They were showing off the chocolate eggs and Easter bunnies they found hidden around the hotel. For the grown ups, there was a special champagne moment before dinner, with one diamond as a surprise hidden at the bottom of a champagne glass. 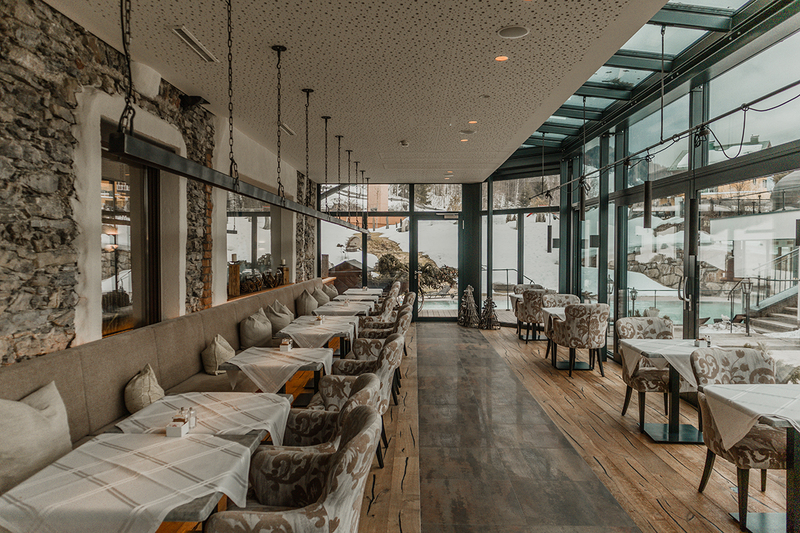 ‘Little’ touches like that make the Hotel Klosterbraü a destination for both couples, or families, it really doesn’t matter: I recommend it for anyone, from active skiers to people that just want to relax in the famous Klosterbraü spa. 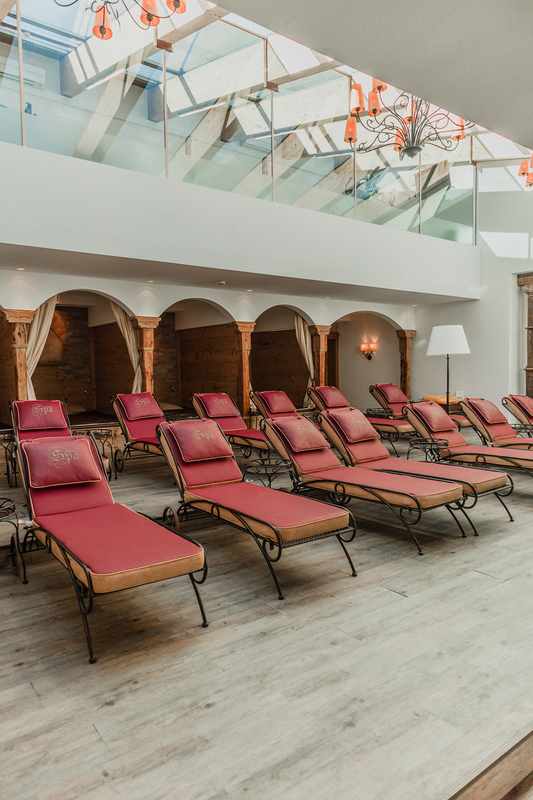 Because the spa at Hotel Klosterbraü is just stunning. 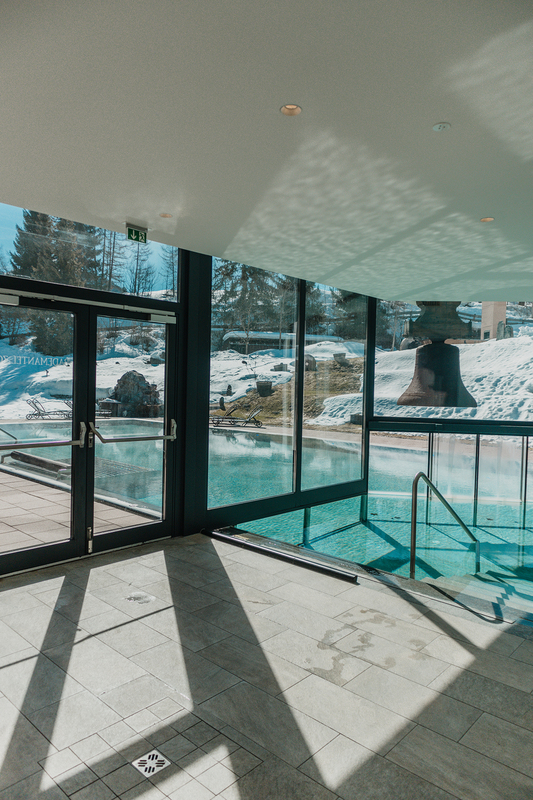 I can’t think of many hotels in the Alps that have both an indoor pool and an outdoor pool, massage rooms for the many types of treatments, saunas and special relax rooms for some quiet reading and contemplation. 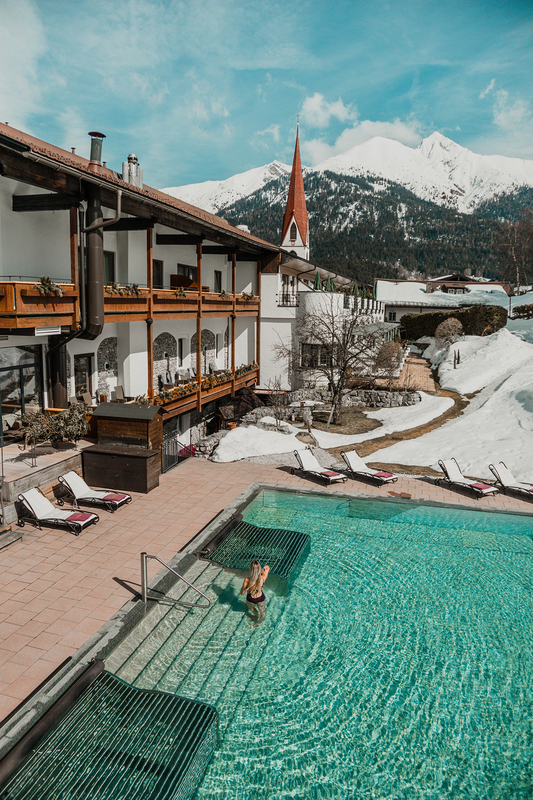 It was so wonderful to enjoy the swimming pools and then just lay on the sunbeds outside next to the pool, overlooking the mountains and the town of Seefeld. I never knew that you can ski and sunbath on the same days in the Alps, in April! We stayed at a wonderful refurbished room. 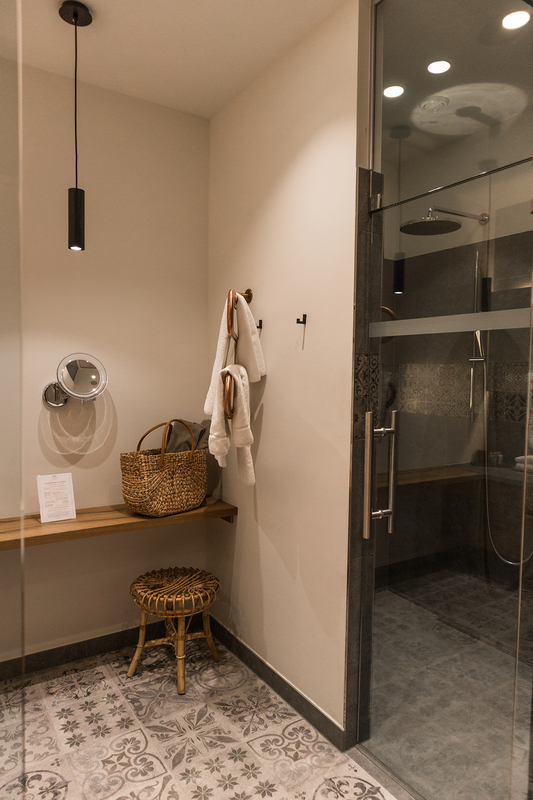 The bathroom had a beautiful glass wall and pretty tiles that I just loved, with one of those strong showers that really wake you up and relax you at the same time. 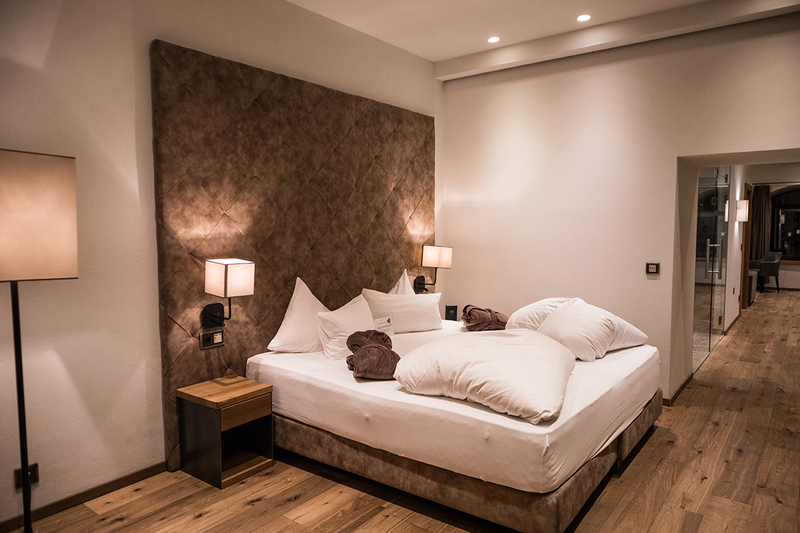 The bed was one of those incredibly rare ones, meaning that they are firm enough so you have proper support, yet the pillows, linen and duvets are so soft that you can’t help but drift off the moment you hit the bed. I loved details like a special Murphy bed for families with kids -which makes sense, because the room was large enough for a family- and the round daybed with bay windows overlooking the terrace. 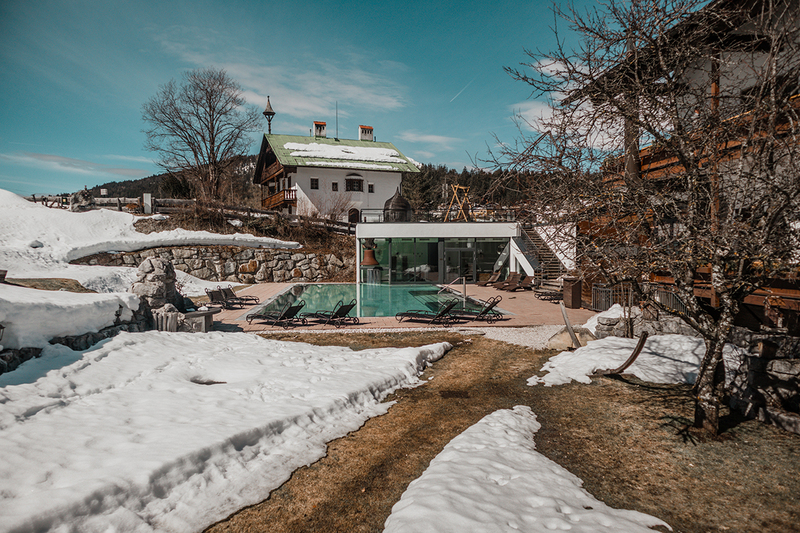 We walked out over the terrace all the time to get to the pool and spa quickly, although the boyfriend also enjoyed hanging out on the other end of the room where there was a proper living room set up, with sofas, tv and the minibar. 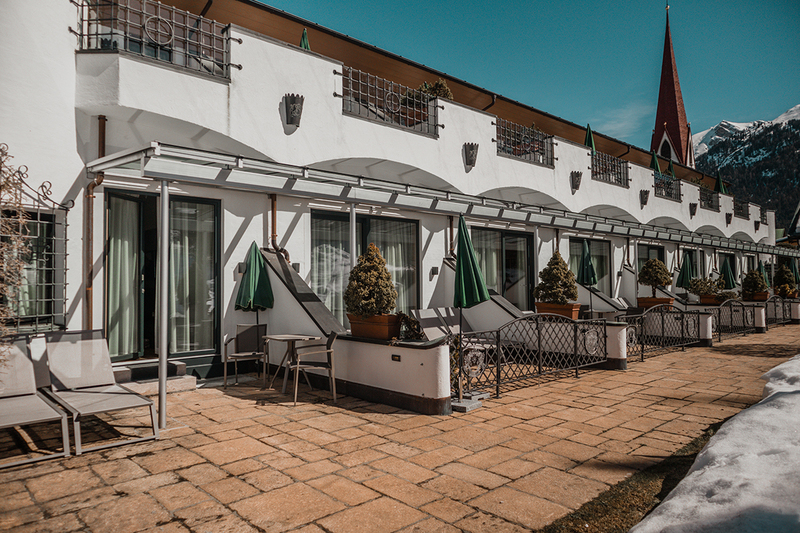 We left on the last day of the season, just before the hotel closed for two months to renovate the last remaining classical rooms and update them to the refurbished style that we enjoyed so much in our room. I have been following the work on the hotel’s Instagram-account every day. 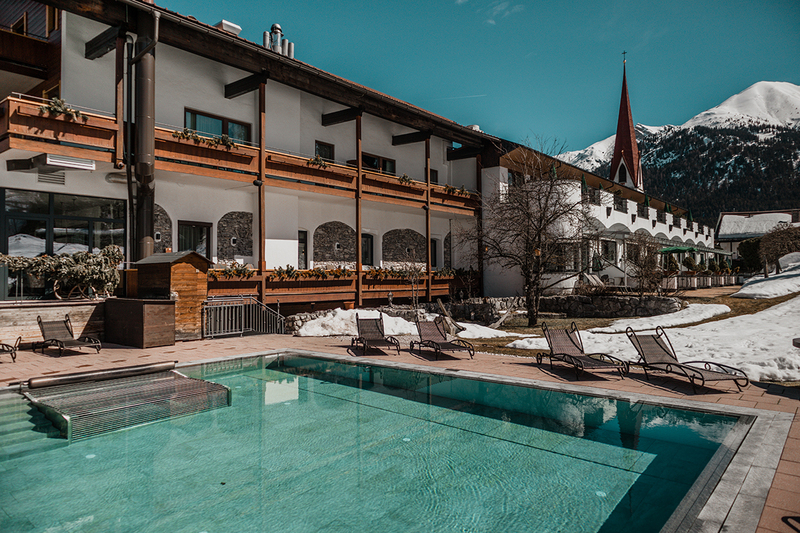 It is just brilliant to see how much effort the Seyrling family puts into making sure that the Hotel Klosterbraü remains one of the best destinations in the Alps, for centuries to come! 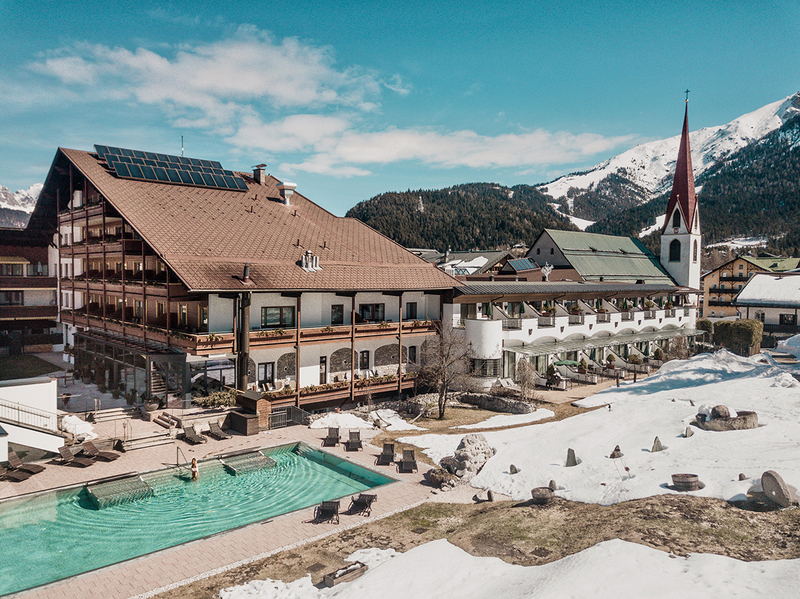 Posted in TravelTagged Austrian family hotel, Easter, Hotel Klosterbraü, mountain townBookmark the permalink. 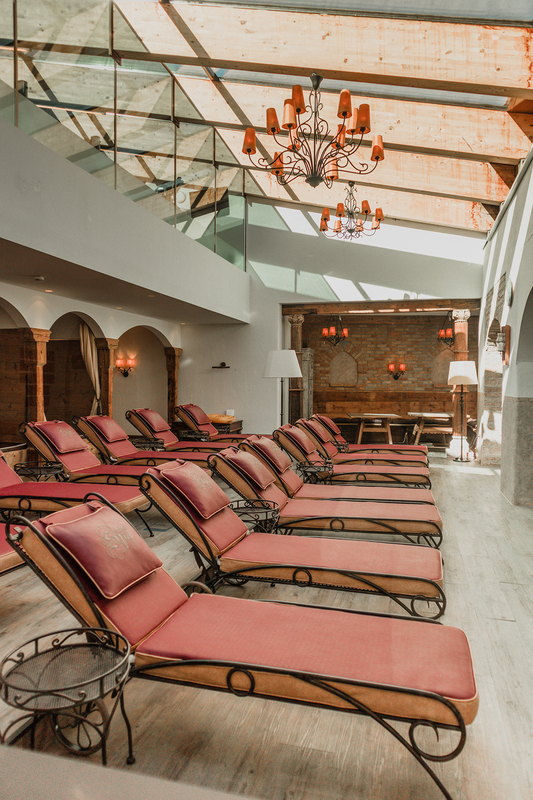 The perfect place for rest and recovery! I love clean air in the mountains after a noisy city. Such a beautiful place and so do you look! This hotel looks amazing!!! I’m drooling at the food! I was traveling Europe in April too and it.was.freezing!! Mad props getting into a bathing suit and the water!! Wow, this place looks amazing! What a dream; trust you had a great time. This has to be one of the most beautiful hotels I have ever seen! 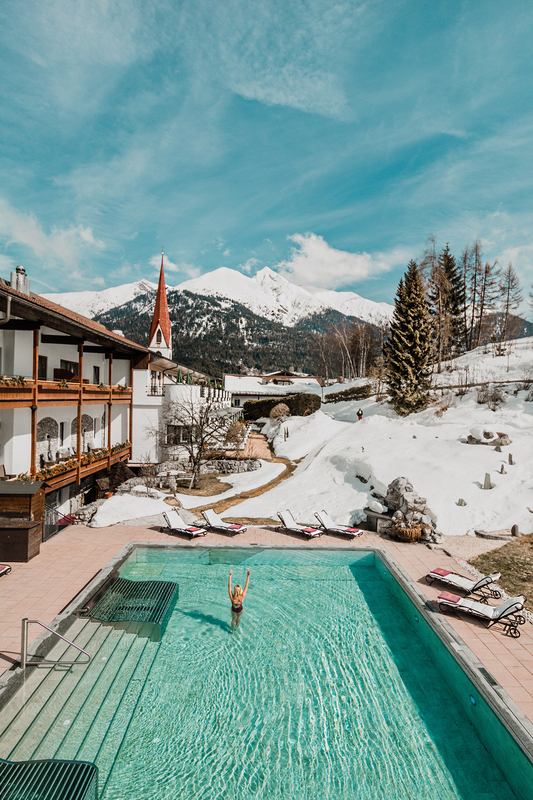 I cannot imagine being in a pool while there’s still fresh snow on the ground but it looks like a refreshing experience! Your blog and pic are just stunning! So beautiful! 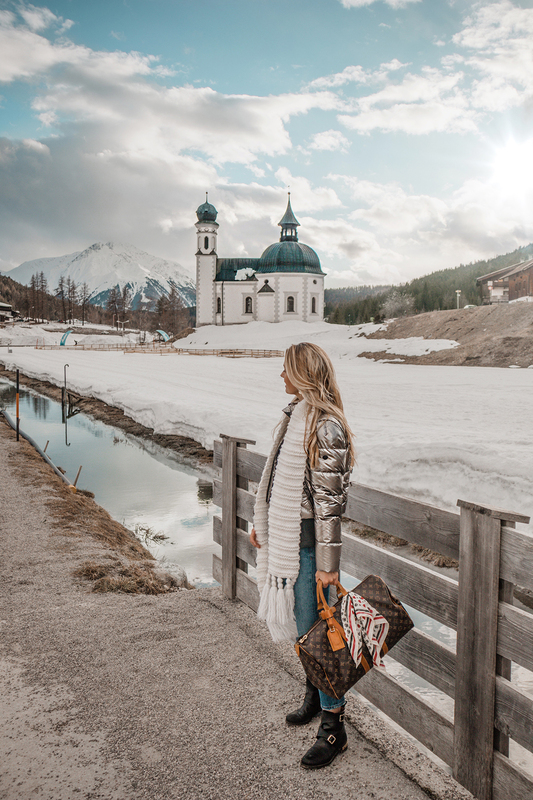 I have fallen in love with your blog – Love your pictures and you look SO good in that red ski outfit! OMG that looks absolutely incredible there! You always take the best photos! Hey you haven’t posted in a while and I miss your posts! Come back please ty ty. My goodness these travel photos give me a true sense of wanderlust! I love that you can ski and sunbathe at the same time, that’s a first! 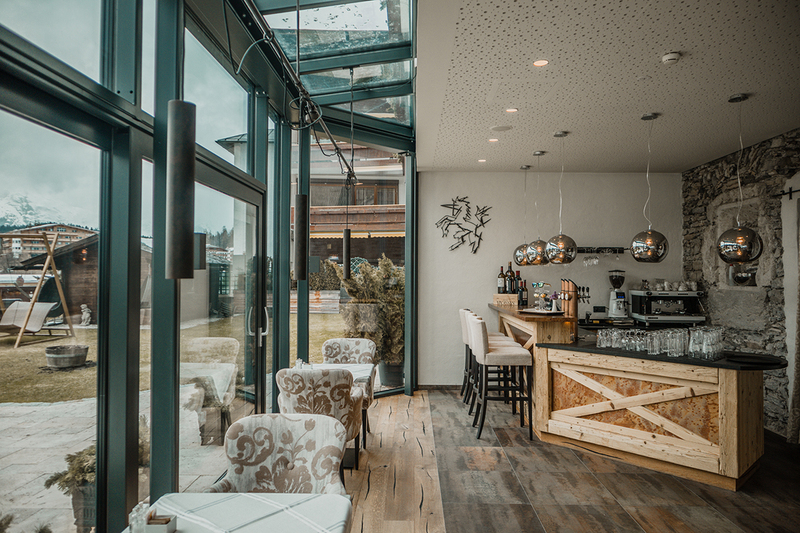 Great thorough post Merel, you sure make me want to book my next travel destination at Hotel Klosterbrau!